Gratitude is one of the most blissful feelings you can experience. There is a small amount of other feelings that can bring you this feeling of bliss. It also alleviates pain and suffering because we are no longer focused on ourselves. We are truly putting our thankfulness out into the universe. And what you give out, must come back. It is a perfectly straight two way street. The more we are grateful and thankful for what we have in our life, the more we will experience this. From people and life itself. Often times if we simply look around, we can find things to be grateful for. Things that could have been right in front of our face. Or directly behind our backs. When you truly think about it, there are literally hundreds of things you can be grateful for. I truly recognized this fact when I was writing this article! Some things are significant and others not so much. Regardless, it feels good to count your blessings. That is why I wrote this article. To remind myself and you that there is so much to be thankful for in this life. And when you start seeing these things in plain sight, you can literally feel wealthy right now. Recognizing that we have it pretty damn good. Better than many people in the world. Below are 301 things to be thankful for. Giving you some ideas that you can use when when you have your gratitude sessions! As well as a few good gratitude exercises that can help you maximize your time in gratitude! There are actually scientifically proved benefits of gratitude that one can reap in. Besides simply feeling good and happy while feeling gratitude. Making your a happier person. That, my friends, shows you the true power of gratitude. How it can transform your life physically, mentally, emotionally and spiritually! You can’t say this for many things! Especially things that are completely free. The list below will give you a jump start in reaping all the benefits of gratitude starting today! Making your entire life better because of it. Lets face it, if the oxygen gets cut off, we are OUTTY! It is something we can easily take for granted. But for anyone who has ever had anxiety or panic attacks, you know the value of a good amount of oxygen in your lungs! One good and real friend is better than a billion fake friends. Who is that one person who has your back? Who when you were down and out, they were right there with you and for you? Reach out to this person and express your gratitude towards them ASAP. Yourself and your perseverance and ability to make it this far successfully. Your ability to express love. The life lessons that have helped you. Gas to get you where you need to go. Public transportation for when you don’t have a car. The ocean that gives us food to eat. The ability and opportunity to get your education. Haters because they make us work harder to prove them wrong. Having a partner in life. Weekends when you can let lose! Your religion and the freedom to practice it. Credit cards that help you pay for things. Savings accounts to promote savings for retirement. Personal development books and authors to help you grow as a person. Mirrors to get your looks on point! Hot water to bathe in. Grocery stores to make shopping easier. A good pair of pants that fit just right. Razors and shaving cream to keep some or all of your body smooth. Music. The ability to ease your pain and help you escape and become more happy. The ability to read and write. Books to get knowledge through. Blogs that you enjoy to read. Pain to teach you lessons and enjoy pleasure even more. Chairs to sit at and tables to work and eat from. Inventors making our lives easier. Warm clothes for the winter and clothes for summer to enjoy the beach. Challenges that make you more tough and give you more perspective. The ability to get free information on the internet. Fire to cook with and keep warm with. People who work at restaurants that cook you food so you don’t have to cook that night. Rain to wash away things and grow newness. Therapists who have helped you let go of your past. Motivational Quotes to keep you pumped up! The stars to look at during the night. Cameras to capture beautiful moments. Your unconscious functions of your body like breathing and your heart beat. People that are organ doners, just in case you every need one! Coupons so you can get better deals. People who have helped you in life. Alarms to get us up on time. Playlists that you use for various things in their life. Funny jokes and comedians to make us laugh. Massage therapist to ease your tension. Buttons to keep your clothes on! Dodo picker uppers for your pets. Dog breeders that give you the chance to own a puppy! Audible or audiobooks in general. Fit-bits and calorie trackers to keep your diet on point. The fact that you can turn off your “read” notification so people never know if you are ignoring them LOL! Children to remind us to smile. Our passions that have been given to us. Bags to carry your stuff around. Tax season if you are getting money back. Experts we can learn from to cut the learning curve. Your goals and dreams that give you hope for a better future. The auto save when your computer goes down. Hobbies that keep you happy and sane. Web hosting for your blog or website. The new friends you have made. The breakthroughs you have had. Credit card memory services so you don’t have to put in your credit card information for online purchases every time. All the times you didn’t get caught speeding! Free trials that you opted out of before it was time to pay! The fears that you have conquered. Bucket list ideas that you have checked off. Astrology services that have told you so much about yourself and about your sign! Tony Robbins talks about how he starts his day off with thinking about three things he is grateful for. He talks about he starts with an easy one like the smile of one of his kids. Then he feels it deeply. And then moves onto an even more significant one. Then lastly the most significant. This can be something like the relationship with your creator. Or the love you feel when you thinking about your spouse. Journal out about the things you are grateful for. This is another opportunity to feel what you are grateful for completely. Allow yourself a complete brain dump. A stream of consciousness. Just keep writing what comes to mind. Don’t judge it. Allow yourself to feel the emotions that come up. No matter what they are. Focus on 3 to 5 things at a time. And really expand on them. Feel each one deeply for a minute or so. Or more if you are on a roll. Especially when you are touching upon the people you are grateful for. They are more important than things we are grateful for. Allow yourself more time for the people you are grateful for. Also, don’t overdo this gratitude exercise. It is more about quality over quantity. Journal about what you are grateful for a few times per week. But really savor the process. Instead of just trying to knock it out daily. This way it doesn’t become a task. More so just a good habit. Keep this journal on you as well. That way if you find that you are down and out that day, you can whip it out and give thanks. Or if something pops in your head, you can jot it down right then and there. This will help you realize it’s power and significance in your life. And be even more grateful for it. This is just like a piggy bank. But you write the things you are grateful for on a little slip of paper and slip it into the jar. Making deposits on the things you are grateful for. This is more of a visual thing to have. Allowing you to look at it anytime you are at home. It is a great reminder to both add more things to it. And simply recognize all the things you have to be thankful for. At the end of the day, when we think about the total opposite of things we can get a good perspective. For example when we are in fear, we need to think of the times when we acted courageously. It is a gentle reminder of the feeling of courage to smash through our fears. Some when it comes down to gratitude, a good thing to do to real feel grateful is to think about a few things you take for granted. Then you become grateful for those things. Deeply grateful. Something as simple as the fact that you have a car and don’t have to walk or ride public transportation. Write letters to people. Text them. Leave sappy voicemails for them. Reach out to people you are grateful for. Organizations or businesses that you are thankful for. Teachers, cops, hell even the post office for mailing out your mail! There are always positive things that happen to us on a daily, weekly, monthly and yearly basis. You can find tons of things to be grateful for if you look back on your past this way. Cardio! No way right?? Haha but on a serious note, simply walking around and becoming mindful surroundings can show you at least a dozen things you can be grateful for. I honestly did this while writing this article. I looked around and simply used my senses to probably offering you twenty different examples of what you can be grateful for! It works well, try it! So there we are my friends. A list of things to be grateful for. 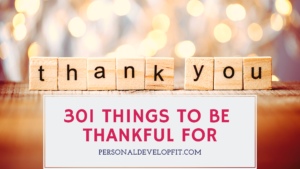 I hope it served as a list of examples of gratitude that you can use to see the things in your life that you are thankful for. Share with me what your favorites were. As well as if you have any good things to add that we can all be thankful for. Maybe something you take for granted for have become more thankful for recently!